Due to being part of the teen pregnancy epidemic, I had a lot on my plate at a young age. Health was not my priority at the time, but I loved food. Food and I were having an illicit love affair! Plus, I used pregnancy as an excuse to eat whatever I wanted, whenever I wanted. Eating two Big Macs in one setting every time McDonald’s advertised the 2 for $2.00 sale was my norm. I remember downing a chicken box containing 6 deep-fried wings, a side of greasy fries, and a gigantic lemonade. Then, there was the time I crammed down four hot dogs with cheese for breakfast before going to school, not to leave out the time I consumed an entire box of Swiss Rolls for a snack. And let’s not forget the episode of eating an entire cake in one day! I wasn’t eating for two, I was eating for me. This behavior flourished throughout both pregnancies and continued after the children were born. After giving birth to my second child, I was diagnosed with high blood pressure. I was 21 years old. High blood pressure, congestive heart failure, kidney disease, and diabetes run rampant in my family. I did not take it seriously until it hit home. As stated in the previous article, my brother and I started walking and eating healthier food to lose weight. Over the past 20 years, I’ve managed to stay at an acceptable weight. I still exercise regularly and I track my food using My Fitness Pal to keep my diet in check. After losing weight initially, I physically felt better and I was more active. However, my self-image didn’t match what I saw in the mirror. Mentally, I was struggling with my new appearance. I still saw myself as overweight. And I still had a lot on my plate with parenting, finances, adjusting to a new job, and maintaining a home. I never gave myself a chance to fully experience life. It was like being on a battlefield every day. I immersed myself in afterschool activities with my children to stay busy. I was blessed to have support from my family and my children’s family whenever I needed help. 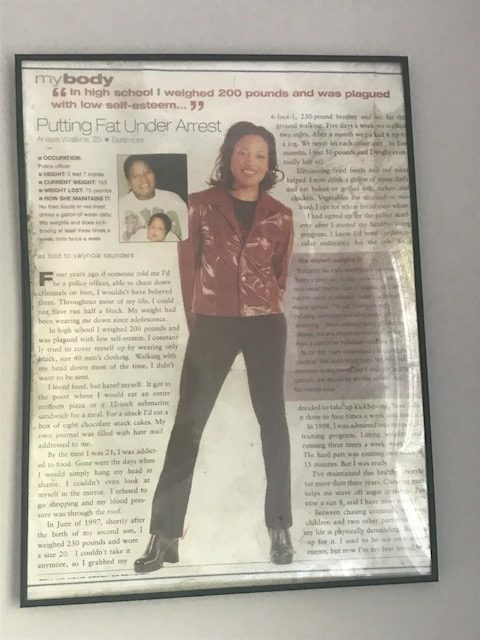 One day, I came across an article in the Heart Soul magazine about weight loss stories. Readers were being asked to submit their weight loss stories and photos for a chance to be featured in the magazine. I decided to submit my story, although I didn’t think I would be chosen. A couple of months later, the phone rang and I was informed that my story was selected! Unbelievable! The journalist interviewed me over the phone for the article. A makeup artist and photographer met me in Baltimore for the photo-shoot. Another win! The article was featured shortly thereafter! I was famous, but not for long! The magazine article and the health scare encouraged me to focus on maintaining a healthy lifestyle. Today, I hold certificates in Personal Training and Sports Nutrition. Diet is the most important part of your fitness journey. If you don’t know where to start, seek professional help from a nutritionist and a personal trainer. Take that first step! It’s hard but it’s worth it. If you are low on funds, there are several free Apps such as Loseit! and My Fitness Pal that will help you track your daily food intake and exercise. Walking is free! Podcasts about exercising and eating well are free too! Find a buddy and hit the track or walk the neighborhood daily. Set realistic goals and expectations. And for crying out loud, cook your own food and stop eating out! Last but not least, water does the body good. Again, all it takes is the mental fortitude to put the bag of chips down, get off the couch and take that first step! Reader, did you exercise today? I didn’t realize you were a long-time celebrity! I’ve loved using Lose It over the years… need to get back into it. 😂fifteen minutes of fame! I like MFP better because of the additional information and articles they provide! And it syncs with my Garmin!